Are you considering spending money on a fancy new GPS device? Hold on before you do and consider this. Personally, I am a fan of GPS, but I don’t think its worth the cost to have a dedicated GPS device. There is an alternative in your pocket! Most Smartphones have a built-in GPS receiver that will work without cell reception. There are many apps that have similar functionality to a dedicated GPS. Google Maps app is common, its free and works offline. But beware that many trails are not shown and the Terrain feature is mostly useless for backcountry navigation. If you use Google Maps, try it out a few times before leading a group into the outdoors with it! I highly recommend Gaia GPS app for iPhone and Android. The app is only $20. This is probably the best maps app for backcountry locations. It has topo maps which can be downloaded for any location (this must be done over Wi-Fi) and subscriptions are not necessary as with other apps that don’t have an upfront cost. Of course, there is nothing wrong with a good old map and compass. I recommend having both a print map/compass and a GPS. I use a map and compass primarily, its quick and preserves battery life of your digital device. I have a GPS app so I can cross-check my position from time to time. Another benefit of using this tandem approach is that printed maps will sometimes have local info that digital maps might not such as newer trails, iconic points of interest (POI), water sources, and other useful tips. 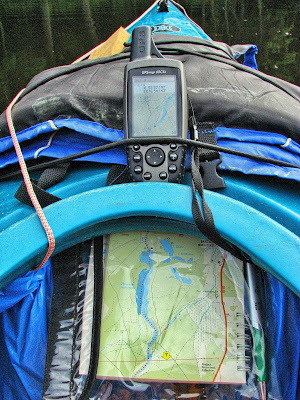 Digital maps allow for zooming in and out and measuring distance more easily. Plus, if one gets wet or lost, you have a backup. Deciding on the proper set up depends greatly on your needs and budget. A Smartphone can double as a communication device in areas with service. If you travel into the backcountry in the eastern United States, you will often have at least one or two bars; enough to send a text (many locations now offer 911 emergency text support). More towers are going up all the time. The western U.S.A. and other countries might not have the same coverage. If communication with the outside world is a necessity for your ministry, you may consider purchasing a Personal Locator Beacon (PLB). There are several different options on the market. Read more about them here. I encourage you to do your own research online or by talking to a sales expert at your local outdoor retailer. If you want the comfort of a GPS device and you don’t have a large budget, look for a unit such as the Garmin eTrex or Magellan eXplorist. These are great as for an organization or club because anyone can use them. An app will be on only one person’s phone. They have long battery life and are usually waterproof. You can carry a few spare batteries just in case. Then, everyone can leave their phones and enjoy nature without interruptions or risk of loss. If you have a tight budget a GPS app is still probably the way to go. But if you like simplicity and leaving your phone in the car, but want the added security of GPS, there is another option. Bushnell makes a device called Backtrack. It is a simplified GPS unit. It displays no maps, but it can mark any location, and then guide you back with its built-in digital compass. They have two main models, the Personal Locator at $50, and the D-tour at $85. The Personal Locator can mark up to 3 locations with the click of a button. The D-tour can do 5. The D-tour also tells you your rate of travel, altitude, the temperature, and atmospheric pressure. What this offers is easy navigation back to the vehicle or camp. Note, you must mark these locations while there. You cannot enter coordinates into these devices. I like the Backtrack because it offers near foolproof use. I have led outdoor trips where I was the only competent map and GPS user. This is concerning because if I get hurt, everyone else is as good as lost. I can demonstrate use of the Backtrack in about 2 minutes, much quicker than a map and compass or full feature GPS. The Backtrack is simple enough a young kid can use it. If a leader gets hurt, another leader or even participants can follow the digital compass to get back to camp or the car and help. All they must do is stick to the trail and go in the direction the arrow points. The Backtrack is cheap enough you might consider purchasing 2 or 3 for trip staff. I like having one as an added layer of security that doesn’t break the bank. Finally, there is a hybrid option. But it comes with a hefty price tag, around $500. It is the Garmin InReach (previously Delorme). It is a hybrid device because it is both a GPS and a PLB. The newer models can also provide you with weather updates for a subscription. This is the ultimate in security. It has all the bells and whistles you could need or want. It offers color topo maps, GPS texting for non-emergency communication, and a PLB feature that alerts search and rescue to your location. If you can afford it, I do recommend it. If your ministry does not have the budget, consider purchasing one of these options yourself and bring them along for added safety. But remember, none of these options are a replacement for a traditional map and compass and the skill to use them. As stated previously, I always take a print map, compass, and GPS. No tools can replace skills in backcountry navigation. If you have never learned skills in this area, you should. Start by watching some videos on the internet or reading a book. Then get instruction from a skilled teacher. Teach them to your staff and participants. Everyone enjoys learning how to find their way outdoors!